Over the last few years, Guido Ristorante has become one of my favorite spots in Piedmont. Located in the stunning Villa Reale at Fontanafredda, Guido brings together a contemporary take on Piedmontese classics in a refined, striking setting. High ceilings and spread out tables add to an impression of airiness to the room. 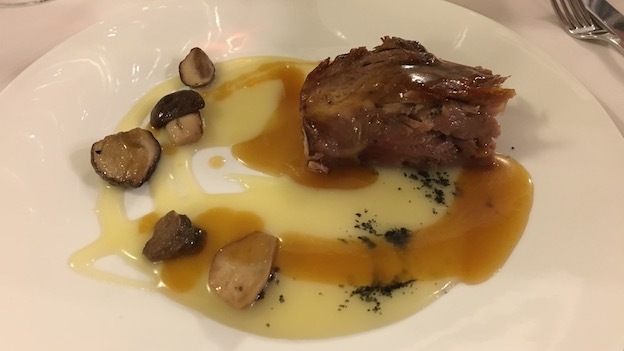 Guido is a perfect spot for a relaxed, leisurely dinner away from the hustle and bustle that is so common in other spots during truffle season. The Alciati family is Piedmontese royalty. Brothers Ugo and Piero Alciati have been at Fontanafredda for a few years now. Their younger brother, Andrea, runs Guido da Costigliole at the Relais San Maurizio. All three brothers continue the legacy of their parents, Guido and Lidia Alciati, who set the bar for fine Piedmontese dining well before the region was the popular destination it is today. Our dinner is delicious. I never miss a chance to order the yellow pepper stuffed with tuna, which is one of the signature dishes at Guido. If there is a better food marriage than poached eggs and white truffles, I have yet to find it. 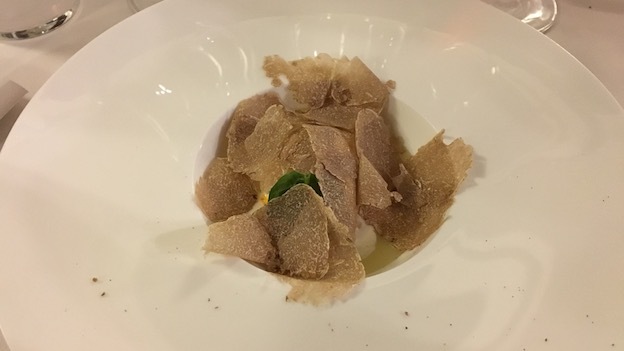 The warm yolk and white truffle meld together in a sublime dish that is also the perfect foil for Nebbiolo in its many guises. The agnolotti are first served with a light sugo d’arrosto (braised meat sauce) that beautifully expresses the refinement of the Piedmontese kitchen. A few minutes later, Piero Alciati appears with a plate of unseasoned agnolotti served on a cloth napkin, in the manner the just-cooked agnolotti were once brought to the family patriarch for approval before they could be served to the entire family several generations ago. The roast veal with vegetables is simply, tasty, and most importantly, a fabulous canvas for the wines we have assembled. I skip dessert, but some of my friends have the homemade fiordilatte ice cream, which I heartily recommend. Our wines are equally terrific. The 2008 Rinaldi Barolo Riserva Selezionata Brunata is a big, powerful wine. The Riserva is a rare bird, a 100% Brunate Barolo that is bottled in magnum for a few select longtime customers. What can I say? It’s good to have friends who have been buying these wines for decades. The 2008 Riserva is much more powerful and explosive than the Brunate-Le Coste, with less perfume than that wine often shows, and a greater amount of heft. In retrospect, I wish we had opened the 2008 earlier (it was logistically not possible) as the wine really opened up with aeration. The 2008 Monfortino is hauntingly beautiful and polished right out of the bottle. Of course, the 2008 will be even better with time, but I remain quite taken aback by how accessible it is even today. Silky, perfumed and finessed, the 2008 is simply magnificent. And in short order, the bottle is finished. The 1974 Ceretto – Bricco Asili Barbaresco Asili is another rare bird, as it is the first vintage for this wine. I have never seen the 1974 in magnum, but here it is, and in fine shape. Fully mature and highly expressive, the 1974 embodies all the reasons we cellar wines. Sweet tobacco, licorice, dried herbs, cedar and dried cherry notes are nicely delineated. Initially quite pleasing, the 1974 fades a bit with air, but it is quite pretty for about the first hour or so. If I had to make a list of my favorite Barolos, the pre-Monprivato Barolos of Giuseppe Mascarello would surely be among them. The 1964 Barolo harkens back to an era when Mascarello, like most producers, blended fruit from various sites. 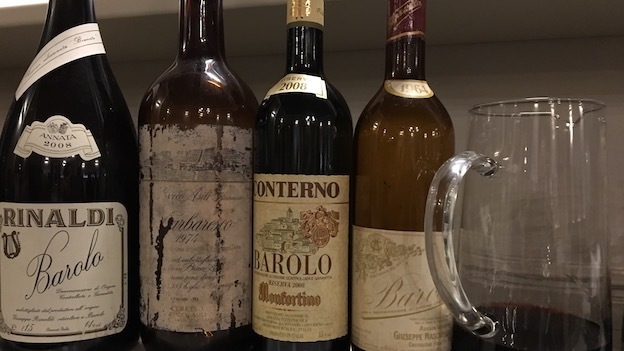 Now in the autumn of its life, the 1964 is fully mature, but it is a striking, hauntingly beautiful wine that is everything old-school Barolo is all about. What a pleasure and privilege it is to drink this reference-point wine from one of Piedmont’s top families. And with that, another memorable meal at Guido comes to a close. The cool, bracing fall Piedmont air is invigorating. Come October and November, there is simply no better place to be.